Friday, Nov. 18, from 11 a.m. to 1:30 p.m.
Friday, Nov. 18 | 11 a.m. to 1:30 p.m.
Plant Tours: Every 15 minutes, from 12 to 1:30 p.m. The Town of Lyons, Honeywell, and project partners invite the community to celebrate the completion of the wastewater treatment plant at the grand opening ceremony on Friday, November 18. The event will take place on-site (100 2nd Ave., Lyons, CO 80540), from 11 a.m. to 1:30 p.m. Plant tours will be provided every 15 minutes, from 12 to 1:30 p.m. Opening speeches will begin at 11:30 a.m. and refreshments will be served at noon. Special guests speaking at the event include representatives from the offices of Governor Hickenlooper, Senator Bennett, Representative Polis, Department of Local Affairs, Colorado Department of Public Health and Environment, and Honeywell, along with Town officials, Lyons Mayor Sullivan and Town Administrator Simonsen. Please join us in celebrating this milestone! Please join us! We need to know what you think! The Town and its consultant team of Design Concepts (along with GreenPlay and Amec Foster) welcome the community to participate in the first town-wide gathering focused on planning for the deed-restricted buy-out properties (Dr. BOP) - the parcels recently attained through federal buy-out programs. The team of planners, engineers, and cost analysts seek input and guidance from the community, from which a plan for future use will be established. This town-wide gathering will focus on the use and management of the new community spaces. 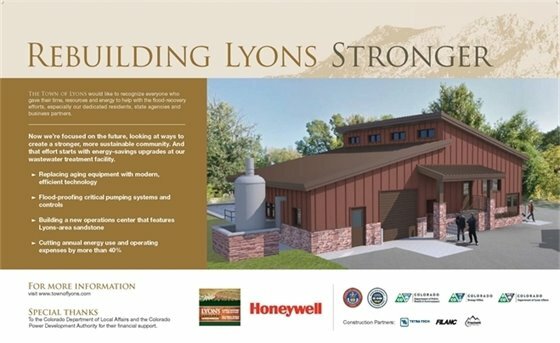 The planning team's goal is to create a local place that is unique to Lyons, its identity, and its one-of-a-kind character. Please direct questions or concerns to Matthew Manley, Flood Recovery Planner. The Town and its contractors are excited to announce the opening of 30 additional parking spots along Railroad Avenue! The now one-way (eastbound) road accommodates parallel parking on both sides. As a small town with limited parking, patrons, business owners, and residents have expressed concerns to the Economic Development Commission regarding parking in Town. With 30 new parking spots, the EDC is excited and hopeful for additional parking, and encourages business owners to please consider asking employees to park in the new spaces, or further away from the central business core. 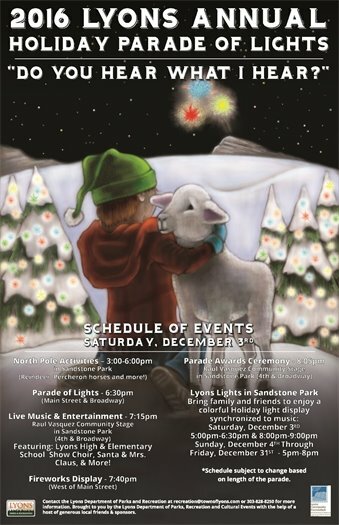 By doing so, more spots are available on Main St. and adjacent business lots for patrons to support the Lyons economy.